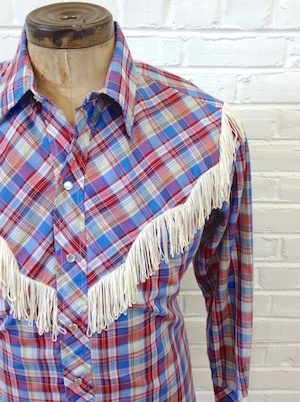 (L) Mens Vintage HBarC Western Shirt w/ FRINGE! Blue, Red, Yellow Plaid & Off-White Fringe. 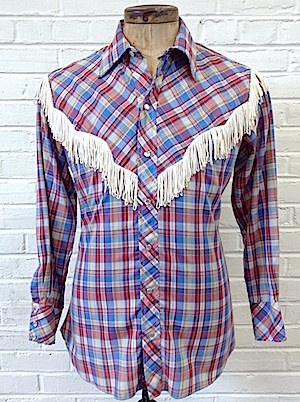 Home > Men's Vintage Shirts > Western Shirts > (L) Mens Vintage HBarC Western Shirt w/ FRINGE! Blue, Red, Yellow Plaid & Off-White Fringe. Who doesnt love a man in fringe?! Vintage H Bar C California Ranchwear men's cowboy shirt. Warm plaid of pink, blue, violet, dark red, white, pale green, and medium blue. Classic pearl snaps down the front. The front and back yokes are extra deep and accented with pearly off-white FRINGE! Love it! Tagged HBarC California Ranchwear, Long Tail. Poly/cotton. 3-snap cuffs. Slightly tapered hem. Condition: Very Good. a few fringe are a bit thready but no empty areas. Sleeves: 30" collar to cuff / 24" shoulder seam to cuff.